“Innovation comes both from new technologies and the market’s demands” stated Evelyne CHOLET, UCMTF Secretary General. She added “the French textile machinery manufacturers are quite strong in long fibre spinning, yarn twisting and control, heat setting, carpet systems, nonwovens, dyeing and finishing, air and recycling processes. We are proud of our strategy to offer customized solutions, and not only off the shelves machinery, to focus R&D on our customers’ requirements, to offer cost effective, reliable, and environment friendly machines.” Then she gave the floor to 4 association’s members and to a guest speaker, Pascal DENIZART, CEO of the European Centre of Innovative Textiles, the CETI based in Lille (Northern France). N. Schlumberger is the world leader in spinning lines for processing long staple fibres (in various blends from any high performance fibres, whether natural or man-made). It proposes 3 processes to produce long staple top of technical fibres: the carding, stretch breaking and crush cutting. Patrick STREHLE, sales director of N. Schlumberger, presented several long-term partnerships with company customers. First, with a Taiwanese customer producing clothes, sleeves, ropes and tapes from metal fibers. 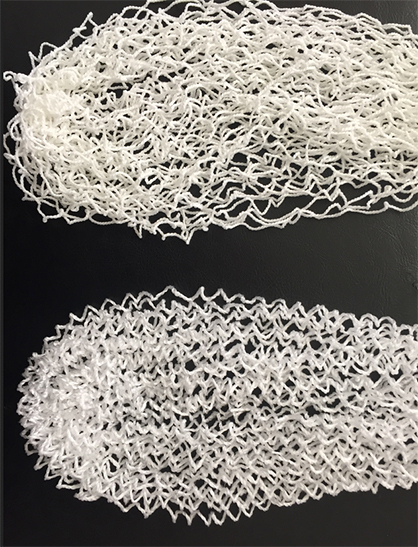 The objective was to produce sliver of 100% stainless fibres from tow of 8 ktex finesses from 8 to 12 microns, in order to process yarn count Nm 6 to 16. NSC experience with stretch breaker model S 200 was used to develop a special model FB20. Following this development, Patrick STREHLE presented a collaboration for processing Para-aramid fibers and carbon fibers (with a German Institute), using the FB20. In more traditional products, Patrick STREHLE described how a special line dedicated to mohair fiber was specially designed for a specialty spinner in carding process. Also, N. Schlumberger collaborates with a European spinner for processing Meta-aramid with the crush cutting process. 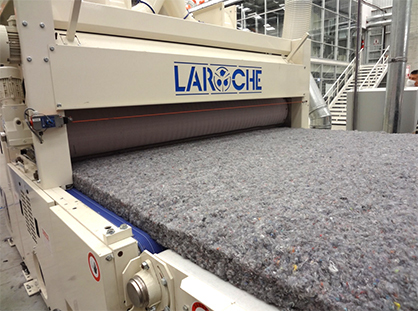 Laroche, in Cours, near Lyon, is a world leader in textile recycling and nonwoven machinery. Elias JUNKER, an Area Sales Manager, described how a recycling and nonwoven eco-friendly solution was tailor made for NovaFibers (Grupo de Todos) in Guatemala. NovaFibers had organized a logistics in the US to collect second hand clothes and transport to Guatemala to resell them but many of these clothes could not be sold for a second life even at very low prices and then had to be thrown to waste. The challenge was to find a sustainable alternative. NovaFibers and Laroche worked together, clothes were sent to Laroche demo room in Cours, recycled into fibers to produce nonwovens which were sent to Guatemala to check if were marketable. Then, Laroche designed a complete line for NovaFibers. Now, NovaFibers imports in Guatemala second hand clothes from the US, resell part of them, and the rest is recycled into regenerated fibers which become the new materials to produce airlay nonwovens for such applications as building insulation, car insulation, felt for bedding, furniture, carpet underfelt, etc. Hubert TRETSCH, Superba marketing manager, explained how a new yarn style was developed in collaboration with a leading Turkish carpet manufacturer. Superba is a French company based in Mulhouse (Alsace). They are the world leader in saturated steam heat-setting machinery required for high quality carpet yarns. Member of the VandeWiele family of companies, Superba and their sister companies offer complete lines to produce carpets. A new textured yarn style, required by fashion trends, was aimed by this major Turkish producer. The demand was developing for textured (frieze) yarns, but the yarns produced with the existing machines showed too high frieze effect, too randomly curved. A light, and especially even frieze effect was sought by the customer and the end-user. The collaborative project between Superba and their customer started in 2013. A prototype was developed with which the customer produced sample yarns and carpets which were tested both from a technical and a marketing points of view. Thanks to the positive feedbacks from the field, the machine was improved and by 2015 the whole process was completed. The manufacturer of key original machinery spare parts supplies textile dryer belts and endless special felts to technical textile manufacturers. David FAUCONNIER, sales director of Dollfus & Muller, presented 3 key belts and felts developed in close partnerships with European textile machinery manufacturers. First an innovative non-marking and non-sticking dryer belt specially developed for thermo bonding ovens for the process of nonwovens. This mesh belt available up to 5.2 meters wide has no fiber sticking at the belt joint which avoids web degradation. Second, a special endless palmer felt for ultra-sensitive fabrics with a felted soft surface which is non- sticking polyester fabrics with weights as low as 90 grams / m2 and which gives to the fabric a new handle. Third, David FAUCONNIER presented a non-marking and non-sticking dryer belt for digital printed fabrics ideal for all ink types, including the reactive ones. CETI is a disruptive textile innovation and applied research center for future trends and needs, adapted to the environment. A place to design, prototype, experiment new products, or material for the global textile chain, explained Pascal DENIZART, the CEO. CETI is active from the fibre core to the heart of retail. Its technological platforms include the latest technologies in spinning, weaving, nonwoven and coating processes and a digital infrastructure to accelerate the lifestyle innovation management. CETI is also a partner in eco-conception and circular economy projects like “Sport Infinity”, a research project launched in the context of the H2020 European Commission and sponsored by Adidas with such partners as BASF. CETI customers and partners are from France where CETI is located but also from other European countries and much further away like from the US. During the conference a breaking news was announced by CETI and the German association IVGT. CETI and IVGT had signed a cooperation agreement that Pascal DENIZART and the IVGT General Director, Dr Klaus-Jurgen KRAATZ were eager to implement.